Habitat for Humanity (HFHI), founded in 1976 and now operating in nearly 90 countries, has helped build over 500,000 decent, affordable houses and served 2.5 million people in 3,000 communities worldwide. Since 1999, Habitat has served over 120,000 disaster affected families with direct shelter assistance and another 43,000 through trainings and community-based DRR activities. HFHI’s experience in Jamaica spans 13 years (1992-2005), involving many community networks and partners, who remain a part of HFHI’s collaborative partnership in the Caribbean region. 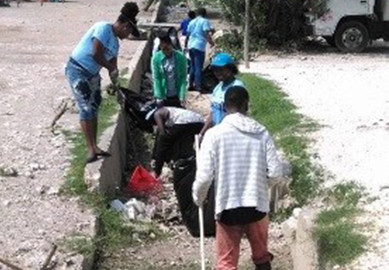 HFHI retains a network of local partner agencies and collaborative stakeholders at the municipal, parish, and National level, and benefits from a strong relationship with ADRA-Jamaica. This coupled with previous experience implementing replicable DRR programming in the Caribbean bring a distinct advantage to the BRACED program. 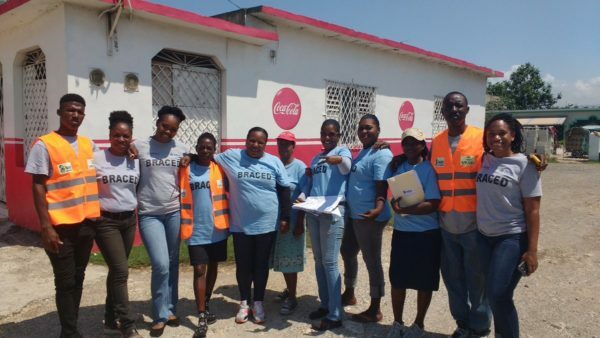 The BRACED project was developed by Habitat International through collaborative partnerships with local actors, specifically local ADRA staff, key informants at all levels of government and the Portmore Municipality. It is funded through United States Agency International Development (USAID) and is schedule to be in operation over a 33 months period. The main goal of the project is to support, innovative and provide proven ways to reduce the risk of disasters; to populations living in hazard-prone, marginalized and vulnerable URBAN neighborhoods. This will be done through applying the Neighborhood Approach, which is a collective effort between the Habitat and the communities to implement the activities of the project. Since December 2014 HFHI has worked within the communities of Gregory Park, Newlands, and Naggo Head targeting the residents of urban settlements facing high levels of risk exposure. Criteria for selection of recipients included the results from the Participatory Approach for Safe Shelter and Settlement Awareness (PASSA) risk assessment. Considerations was also given to the number of children in the household; female headed households, elderly family members, and appropriateness of structure and risk exposure level. The total number of beneficiaries targeted are: direct 6,386 and indirect 65,000. Component 1. Shelter and Settlements (DRR) – objective to increase structural resilience and decrease vulnerability to hazards. 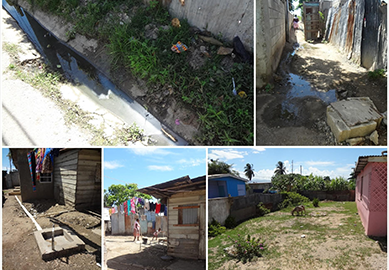 In all three communities, people have been living for many years in inadequate housing. Families will not build new houses from scratch, but will more likely be looking for solutions to enforce and strengthen their existing housing. Building on recommendations and participatory risk assessments HFHI identified 80-90 homes within each community (a total of 250 homes) that required upgrades/repairs or retrofitting. Sanitation infrastructure: Community driven site selection, installation and management of 21 Ventilated Improved Double Pit toilets (VIDP) to meet collective and household sanitation needs. Component 3. 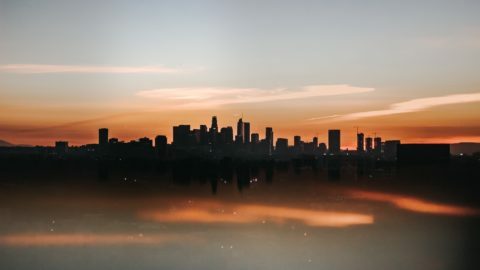 Risk Management Policy and Practice –objective to reinforce community coalitions and risk reducing redevelopment initiatives through sustainable and meaningful public-private partnerships. Implementation is being led by Habitat and the Municipality. 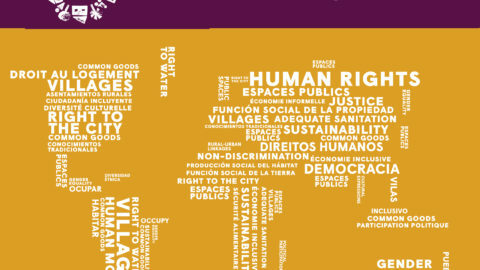 PASSA is both a training and information sharing model that provides appropriate technical guidance, promoting a forum for communities to identify solutions and designate appropriate and realistic strategies to address relevant challenges facing their own shelter and settlement context. Phase 3: Professional Construction Skills Training: HFHI worked with the HEART Trust/NTA and local tradesmen to train approximately 48 residents (16 from each of the three targeted neighborhoods) in the fields of: plumbing, masonry, and carpentry. Construction training programs within HEART were designed to promote risk reduction and hazard mitigation strategies, reinforcing theories and concepts of safe and appropriate building. 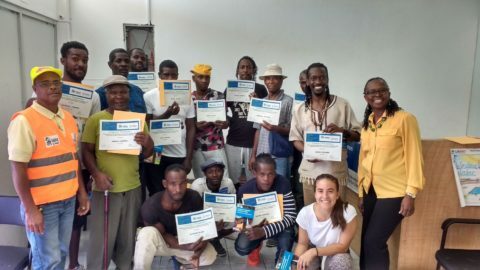 Trainees were selected in consultation with community members, and according to criteria established by HEART and reinforced by the outcomes of the PASSA process. Additionally, Jam Habitat along with local tradesmen trained those persons who did not matriculate into the HEART program in the above mentioned skills. 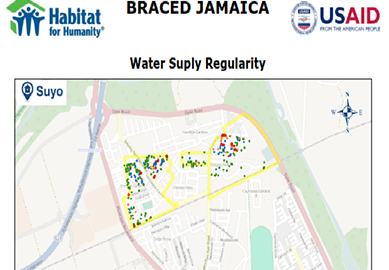 BRACED used a neighborhood-based approach emphasizing hazard risk reduction in land designation and use practices in human settlements, decreasing vulnerability through improved construction techniques.  The proposed Community Resource Center (CRC) model, the nexus of the BRACED project, is an adaptable mobilization and capacity building approach that has successfully consolidated the strengths, capabilities, and motivation of local communities worldwide to increase resistance to natural hazards, particularly through the installation of seismically appropriate construction practices and retrofitting capability. USAID/OFDA, ODPEM (Office of Disaster Preparedness & Emergency Management), Parish and Portmore Disaster Coordinators, Chairman of the Portmore Disaster Committee, Portmore Mayor (Portmore Municital Council ), Social Development Council of Portmore/CDC/PDC. Communities Councilors, Community Representatives in the field, Members of Parliament (MPs) (Mr. Brown and Mr. Jackson), Jamaica Red Cross – HelpAge NGO- Women Resource Outreach Centre, ADRA (Adventist Development and Relief Agency), JCC (Jamaica Council of Churches), University Of West Indies (Regional DRR Centre), University of The Technology, HEART (The Human Employment and Resource Training Agency), CCCL (Caribbean Cement Company Limited_ TCL), NHT (National Housing Trust)/HAJ (Housing Agency for Jamaica), JSIF (Jamaica Social Investment Fund), NSWMA (National Solid Waste Management Agency ), NWC (National Water Commission), Carib Cement Company LTD, Ministry of Health (Public health inspector). 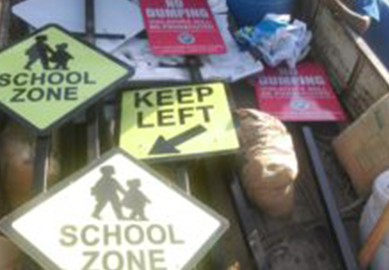 As a part of or DRR preparation safety signs were installed in all 3 communities.